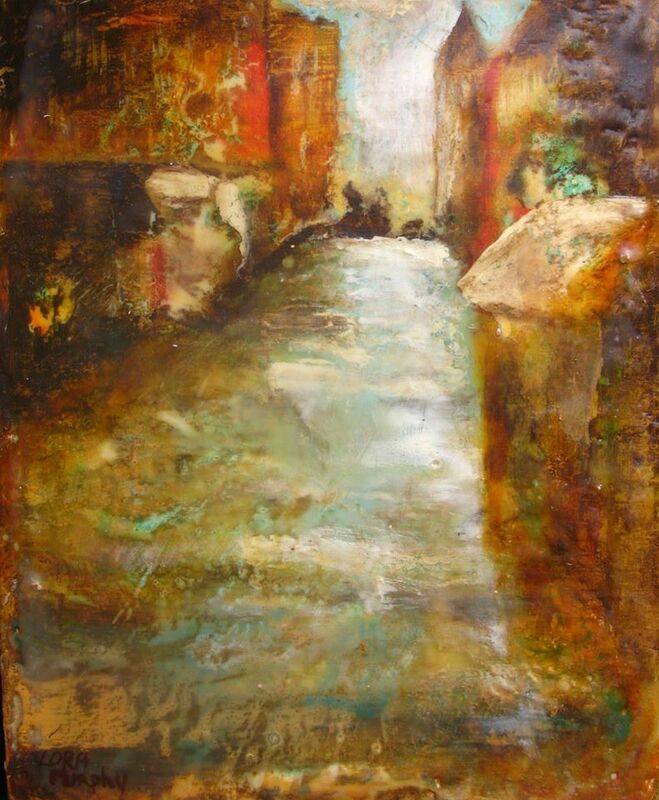 About Lora Murphy: I first heard of encaustic painting in 2007 from an artist in Montana. I had not been painting for many years while I lived in the USA. I was planning to return to Europe but as I watched her apply and fuse the hot paint I was really inspired. There was something about the rich luminous quality of the paint and the unpredictability of the results that drew me, but I remember also having the feeling that somehow I knew how to do this! I recall telling her that I was going to be a full time artist when I returned home! I am sure she thought I was crazy, but that’s what I did! I got Joanne Mattera’s book, The Art of Encaustic Painting, returned to Ireland, and started to learn. It was difficult to source supplies and I made a lot of mistakes trying to figure it all out, but I loved every minute of it. I got a book about the Fayum portraits and was moved beyond words by the beauty and timelessness of them. I remember the first time I made a painting in the style of the Fayum artists; I was completely blown away by the feeling. I immediately felt a familiarity with the process and as though I had done this many times before. It was such a strong feeling and I still feel this every time I get into the “zone” while painting. My inspiration comes from life. I am currently studying for a master’s degree in Jungian psychology and art therapy and I find reflection on the human condition and the human psyche to be endlessly inspiring. I am interested in what drives us, as human beings, and our consciousness. I feel an enormously profound connection to my female ancestors and a deep responsibility to them, to live my life and practice my passion with the awareness that, it is their struggle that has allowed me to live and paint with freedom and equality. To paraphrase Maya Angelou from one of her wonderful poems, “I come as one, but I stand as 10,000.” (The Grandmothers), resonates very deeply with me. To me, this means not just my ancestors but also the family or lineage of artists to which each of us belongs. It inspires, thrills and humbles me to think about and be connected to the Fayum painters of 2,000 years ago, who painted with the same materials and, no doubt, passion that we do. I think there is something about the wax medium that speaks to each of us who use it, on a very deep level. I have so often seen a passion in artists working with encaustic paints that seems to inhabit the deepest parts of them and defies explanation. It is almost instinctual and it keeps us working with this tantalizing, infuriating, marvelous and incomparable medium. I love the portrait work of Frans Hals, Sorolla, and John Singer Sargent with their bravura brushwork, and I am also deeply inspired by contemporary artists who work with passion in encaustic. Marvelous painters such as Birgit Huttemann-Holz, Jeff Schaller, Tony Scherman and Eschwan Winding all work figuratively with encaustic. 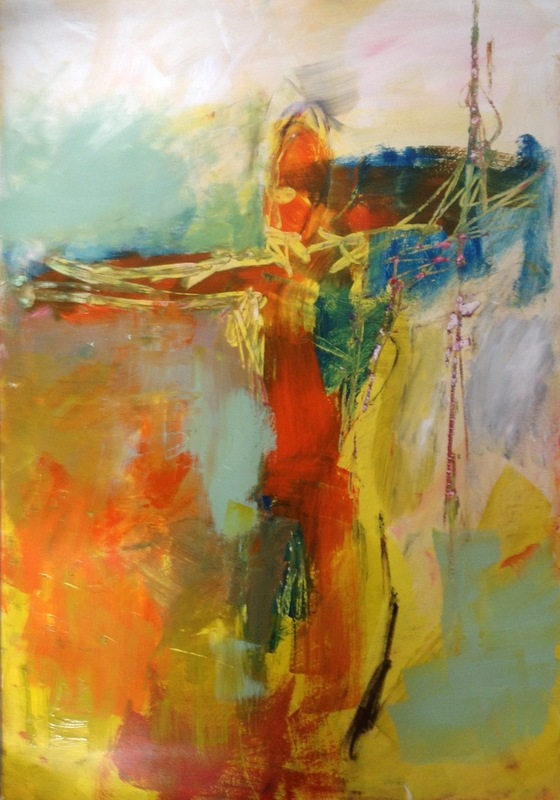 Living in Ireland, it has been almost impossible to see the works of other professional artist working in encaustic in person, but I have met Niamh O Connor who paints vibrant lovely abstracts and Rosemary Langtry who makes luscious landscapes and we plan a collaborative project for later this year. I think overall though, the biggest inspiration has been to see several of the actual Fayum portraits in person in Denmark and Germany. They are astonishing in their vibrancy and beauty. I use many mediums including oil and acrylic, but encaustic is the one that most ignites my passion. It gives me the freedom to express myself in the way that feels most true to me. I can’t explain it exactly but it feels right. It can be a really difficult medium but the beauty and the benefits far outweigh the drawbacks. I think it allows the painter to put so much of their selves into the work because it can be such a fast, right brained process. When I paint in oils, which I also love, I tend to become very involved with the technicalities of the paint, medium, and additives. I studied History of Art and Archaeology at University before going to Art College in Ireland. I then trained at a classical painting academy in Florence, Italy so I have a very deep interest in all aspects of painting, not just the application. When I use encaustic, I have the same interest, but I feel that my heart and passion take over and my work becomes much more intuitive and primal. I want people to be moved by my work! I want them to feel some of the passion that went into the making and I want them to feel a connection to the subject. When I can see this happening, it is a humbling, exhilarating, and very satisfying experience for me. The subjects I paint are very important to me and when another person “gets it”; I feel a huge connection to them. It is especially important to me with my current body of work as the subject is so sensitive and tragic but it has been very well received. At the moment, I am working on a series inspired by the stories emerging in Ireland about the treatment of young girls who became pregnant outside of marriage in the last century. These innocent young women were completely betrayed by the state, society, religious institutions, and their families. It is a monumental tragedy, and I have felt a huge calling to tell their stories in paint. I have called this body of work, “Sinner – the lie of the land”. I have also worked on a series entitled “Ikons of the 20th century”, a series called “Out of Africa” about our human journey and another called “Beauty, be Damned” and many more. Most of my work, at present, centers on women and their stories. I tend to work in series because I find I often can’t leave a theme until I have gotten something out of my system. If I change to another genre I will also work in a series. I always go back to the face however. On a very practical level, I think the use of encaustic helps me to develop my ideas very quickly. The paint cools instantly and then must be worked either just by fusing or by scraping or changing in some way. It is easy to lose an effect, or an entire painting I love. So, I must learn not to be precious about my work. I think that leads to becoming more open to the possibilities and thence, to creative growth. “Be fearless”, is how I try to approach art and life! I love every aspect of the creative process. I like to use traditional recipes to prepare my boards and canvas so I will make rabbit skin glue gesso to prepare my ground. This gives a beautiful velvety surface and I am inspired by the fact that countless artists over the centuries have used this same method to prepare their paintings. After applying several coats of gesso (7 is traditional), I will loosely sketch in a drawing, using Yarka’s Russian sauce. This is an earth based chalk that works very well with encaustic. The emphasis is on measuring and getting correct proportions and placement of the features. My drawing will be accurate but quite stylized and quick. I tend to use traditional oil painting techniques to paint encaustic portraits; therefore I strive to keep shadow areas transparent and thin and to build up my opaque lights. Enkaustikos paints are phenomenal in this respect, as they allow me to build up subtle and beautiful layers of rich color. I try to draw and journal every day and this helps to keep my vision focused. I will have an idea in my head about what I want to achieve, but much of the excitement of the painting process lies in the unpredictable nature of encaustic paint and the unique effects that can appear by accident, as well as by design. In the early days of my painting journey I used to always make all my own colors and then I discovered Enkaustikos portrait paints. I love their colors for the purity and richness and the sheer quality of the paint. They are incredible to work with, actually I will never forget the first time I used them! I was transported! I don’t use the colors straight from the tin, as a rule, but mix and adjust them with other colors in my palette, to lighten, darken, warm, cool, create halftones, create thin transparent washes of rich shadow color, add subtle notes, add a spark or a little oomph . The other colors in my palette include white, ivory black, yellow ochre, bohemian orange, burnt umber, cadmium orange, chromium oxide green, cobalt aqua, cobalt violet, Italian golden ochre, Pompeii red, quinacridone gold, transparent red earth, ultramarine rose, cadmium yellow medium, cadmium red light, cerulean blue, ultramarine blue and viridian green . I made a color chart with the Enkaustikos paint, showing the different combinations of the portrait color basics mixed with the various palette colors, for constant reference, and it is really useful. I always work with it behind my painting so that I can refer to it if I need to adjust colors. I make small ice cube sized pieces of the palette colors with can be rubbed on my hot plate and mixed with the Enkaustikos base. I also use powder pigments and oil bars, but the raw pigments are quite dangerous to use so I am very careful with them. One of the great advantages of buying ready made encaustic paints is that we artists don’t have to handle the raw pigments such as the cadmiums and cobalt that are toxic in powder form. All the hard work is done and the paint is beautifully consistent, absolutely gorgeous! I am having a new web site built at the moment, which should be up and running shortly. I have had my own gallery up until recently but it was too time consuming so I prefer to just paint and let other people worry about the selling! I sell in galleries both in Ireland and Denmark and I have just set up a studio in Denmark as I want to scale up my work for the market there. I love working large. 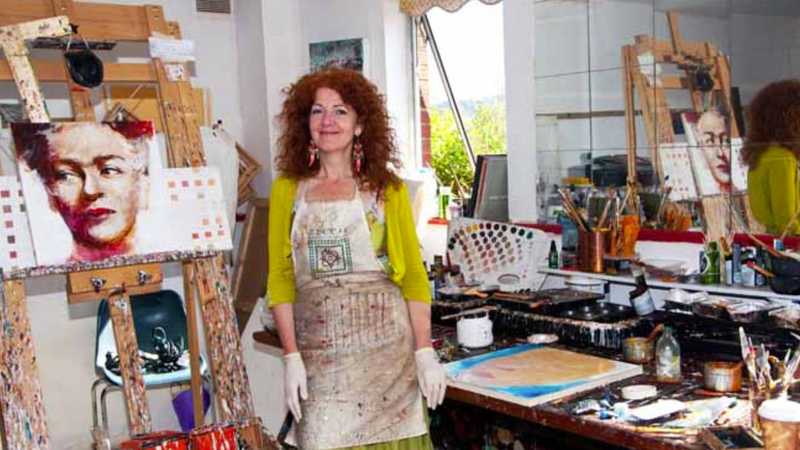 I teach workshops throughout the country and at the Art Hand art school in Waterford, Ireland. I run a life drawing session for artists at my studio once a week as I think it is really important to draw and to work with other artists. The oldest participating artist is a wonderful painter named Walter Verling. He is 84 and has been painting all his life. He is quite famous here but comes to the life drawing sessions because he feels he might finally be “getting somewhere” with his painting! One of the other artists is a genius with an encyclopedic knowledge of renaissance painting techniques. He is a classical painter, really brilliant and generous with his knowledge. He has just made some “black oil” and “Italian wax medium” for me. He has used a recipe from the 15th century painter, Giorgione, which is an incredibly dangerous process as it involves boiling litharge (white lead) with linseed oil. The fumes are very toxic. To make the wax medium he added the oil to clarified beeswax with some pure gum turpentine. He says that you must only use only clarified beeswax as the wax must contain the bees saliva! The mediums are toxic and you must be very careful while using them but I am thrilled to be using such authentic and historically accurate products. Needless to say, I will not be using them with encaustic or heat! I open my studio to students who want to learn and do work experience. I cooperate with a local alternative school for kids who have been unable, for whatever reason, to finish their schooling in a usual academic school. Many of the students are really creative and it has been a really successful program. I love it too, often finding that I learn and benefit just as much as I hope the students do. I think all art is a series of solving problems! That’s what makes it exciting and challenging and a constant passion. I have a concept, a vision of what I want to do – how do I achieve it? I am a very optimistic person so if I encounter a hurdle, I will either, sail over it, crawl under it, sidestep it, ignore it, trample it, dig under it, or go in any other direction. In some respects I am very fortunate to live where I do, as this country is very supportive of artists. We have an exemption from income tax and can get support for college, mentoring and business set up. I would find it very difficult to be forced to do anything other than painting to make a living. My biggest problem is probably that all I want to do is paint! Fortunately, my family is very supportive of me and tolerates, sometimes even celebrates my nuttiness! However, living here has also meant that I am in an encaustic wilderness. 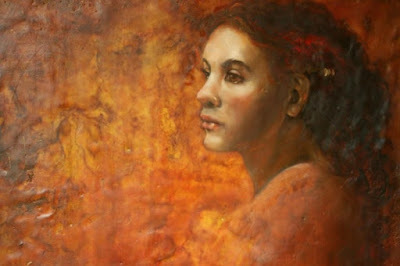 The challenge has been that almost nobody knows what encaustic is and people can be somewhat nervous of it, initially. Supplies can be expensive as I have to get them shipped from the USA for the most part, therefore Enkaustikos paints are the only ones I do not make myself, the only ones I cannot live without!! It is important to set aside a little time every day to deal with the business aspects of art and deal with emails, applications, updates etc, but it can be a struggle. It was harder for me when my children were smaller but I kept a studio at home then so that I could always be around for them if they needed me. Now they are at university so they don’t need me so much! I do use some techniques including collage, transfer and stencil. I just bought a wood burning tool that has a reservoir attachment that keeps the wax flowing so you can make patterns and (hopefully) calligraphy. I am probably more traditional in my approach to painting in some ways but I love mixed media and often use gold leaf, plaster, tar, pastel, oilbar, Yarka Russian Sauce, graphite, and Plexiglas in my work. It really depends on the series I am working on, and what I am trying to say with the work. I think as artists we are so fortunate, as we can never be bored! There are so many problems to solve! My only advice to any artist is to meet with others, share ideas, get inspired, take a life drawing class …you never know who you will meet, and most importantly, Paint, Paint, Paint! As Picasso famously said, “Inspiration strikes, but it must find you working”, so start now, and like Frida Kahlo, “be fearless”! Thank you to http://encausticpaints.com/ for sharing this article.